This will be our fourth annual list of local ice cream shops in Des Moines! Each year I think we’re going to run out of new places to highlight and each year, much to my delight, new discoveries are made. There are LOTS of places to get ice cream in Des Moines that are a step above the ordinary, everyday chain. You’ll find delicious ice cream that can be the highlight of your child’s day (or maybe even their whole summer!) 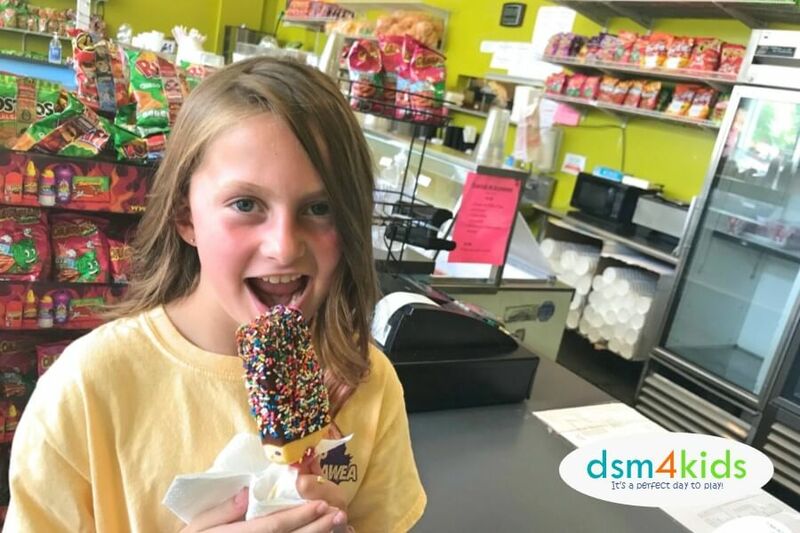 Read on to find some of our favorite local ice cream experiences to cool down your Des Moines kid. If you click over to one of our other articles listed below, you’ll find 20+ local ice cream shops in Des Moines! What’s better than ice cream? Coffee and ice cream, of course! Located near the Science Center and Principal Park, this local coffee shop sells traditional gelato, an Italian style ice cream. 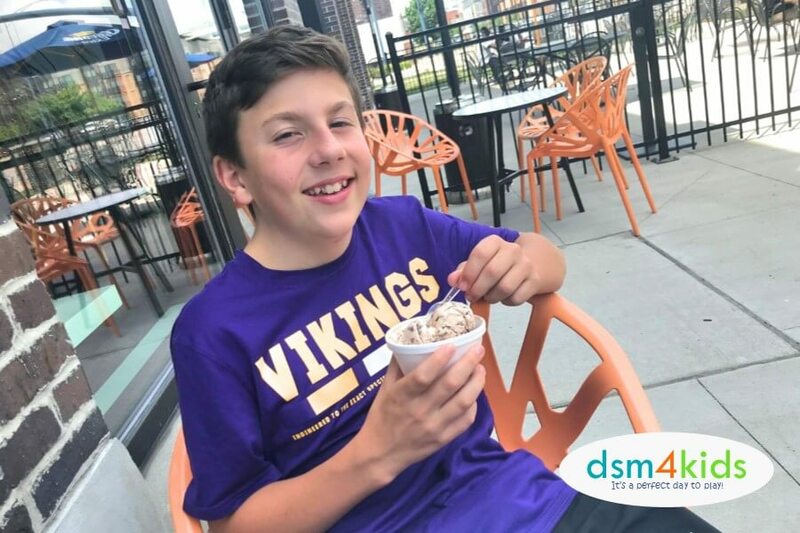 (Bonus, gelato is lower in fat than traditional ice cream, because it has less cream in it…I think that means you can have a double;) DSM Brew offers 16 flavors of this dense creamy goodness in a cup or waffle cone. Choose from a 3 oz, 4 oz, 6 oz, 8 oz or 12 oz serving size. If it’s a nice day, DSM Brew’s patio is a great place to relax and enjoy your summery treat. There’s a new type of ice cream in town! Instead of scoops, Ding’s serves Thai-style rolled ice cream. These treats have taken over social media feeds because they’re so pretty—luckily, they’re also pretty tasty. Choose from several ice cream flavors and mix-ins. Currently, there’s only one generous sized portion, which costs $6.98. Older kids will devour the whole cup of ice cream themselves, but littles will struggle. Find Ding’s Rolled Ice Cream & Crepes on the lower level of Jordan Creek Mall. As the name denotes, this place doesn’t just sell ice cream. This local burger joint recently added ice cream to their menu. 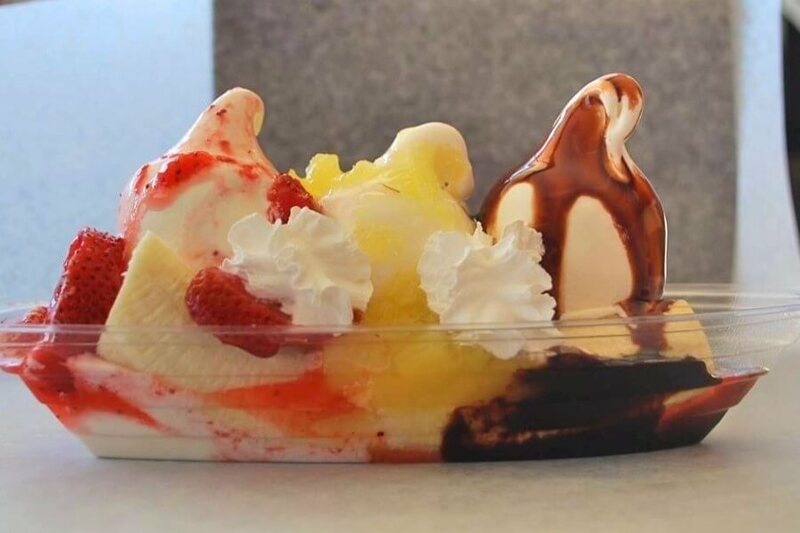 LJ’s is an old-school drive up restaurant that offers soft serve treats like cones, shakes, malts, sundaes, banana splits and Avalanches with mix-ins (like a DQ Blizzard). And if your kids just can’t get enough ice cream, you can order one of their cute ice cream cakes for their next birthday. Not strictly an ice cream shop, you can get a lot more than frozen treats at Paleteria La Michoacana. This Mexican eatery and small grocery store, located just east of the Capitol, has a great selection of ice cream novelties and hand-dipped ice cream. They offer a rotating selection of more than 16 flavors of ice cream that you can get in a cup or waffle cone. They also have a lot of delicious looking treats like ice cream bars, ice cream sandwiches, popsicles, Aquas Frescas and more that your kids will love. You may also want to keep an eye out for their ice cream truck! 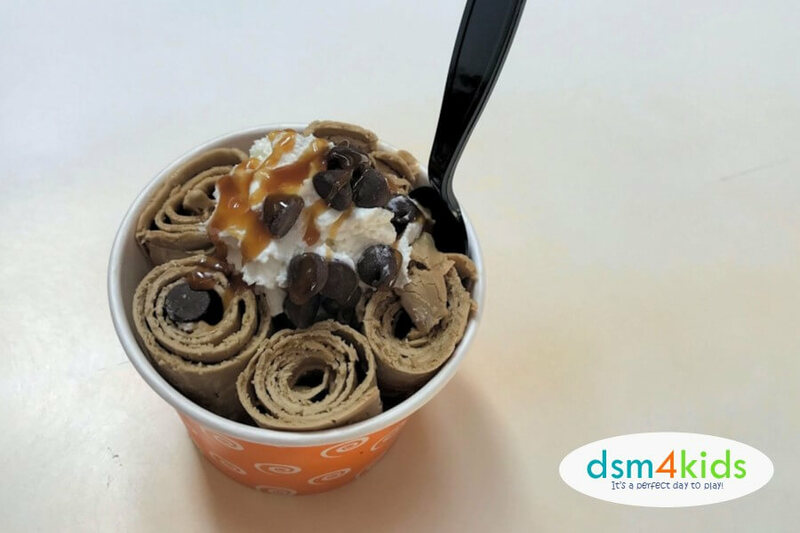 The Thai-style ice cream roll craze continues with Sweet Swirls Ice Cream, which started as a food truck and took up permanent residence in Ankeny and Johnston. A stop at either of these shops is as entertaining as it is delicious. 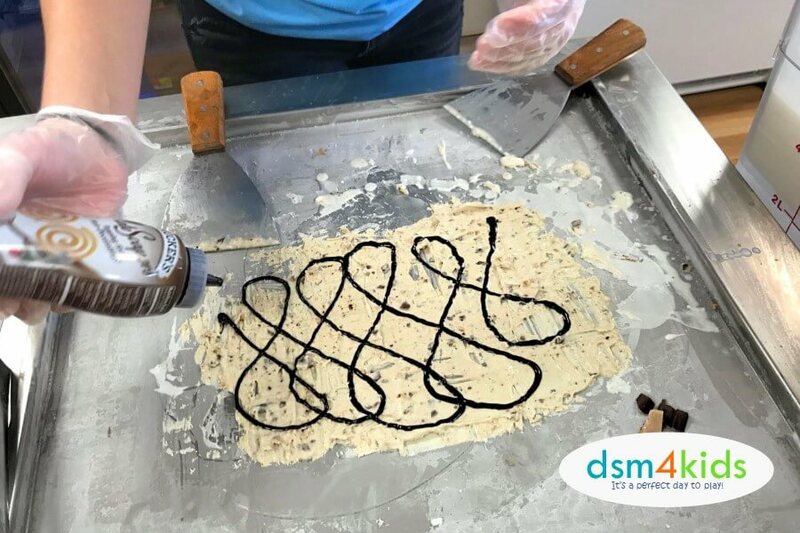 When you come in, you can watch Sweet Swirl’s ice cream chefs shape thin layers of ice cream into rolls and top them with everything from Oreos to coconut. You can pick your size: 3 oz. Kids size is $4 (12 and under); 4 oz Small is $5; and a 6 oz. Regular is $6. For more summer fun, check out our Summer Fun Guide. Do you have a favorite ice cream shop where you chill out at in Des Moines? Share with us in a Comment below!